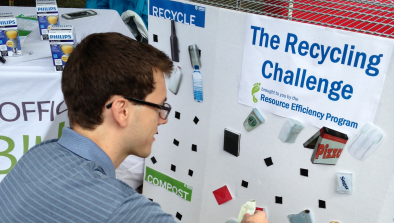 What tips and tricks has Harvard learned in developing intra-office recycling competitions to help drive improvements in recycling rates? In 2012, the FAS Green Program and Office for Sustainability partnered with Harvard employees at 1414 Massachusetts Ave. to launch a floor-by-floor recycling competition that would be a fun, engaging way to increase recycling rates. USE A BUILDING WASTE AUDIT TO ESTABLISH A BASELINE: In order to measure results, a waste audit of the building was performed before the competition happened and after. Here, student intern Emma Framson’15 sorts a random sampling of the building’s trash into what could have been recycled and what was definitely trash. Before the competition, 33% of the building’s trash by weight could have been recycled, but it decreased to 17% afterwards. 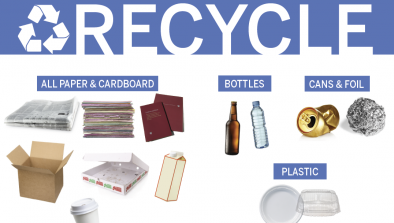 USE INDIVIDUAL OFFICE AUDITS AS AN EDUCATION TOOL: While we contemplated the idea of holding our audits of individual recycling bins after work hours, we found it was important to be able to talk to people about why an item is recyclable or not. Here, student intern Lila Strominger’13 explains why a wrapper is trash to Managing Director of IT, Bob Wittstein. USE LETTER GRADES TO DRIVE IMPROVEMENT: People can quickly relate to and understand letter grades. Use them to evaluate a bin or a set of bins. We found that employees will really be proud of their good grades, and eager to fix lower grades. Here, Steve Burns of HUIT is pleasantly surprised to be receiving an “A-” after having his bins audited. ENCOURAGE COMPETITION: Encouraging excited staff to post their good grades publically and build on the competitive nature and serve as a frequent reminder to others that they should recycle. Here, Bob Wittstein posts his second “A” on his door. CREATIVITY DRIVES SUCCESS: Encourage eco citizens to come up with creative ways to remind their coworkers about the competition. Here, Marva Bernard-Saunders has decorated the trash can at Research Administration Services to remind her coworkers to think before they throw. CREATE A FORUM FOR ANSWERING QUESTIONS: At Human Resources, Audrey Harmon taped common items to their correct bin, and instituted an “I don’t know” basket. 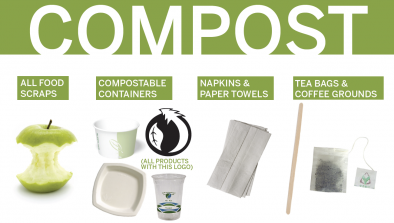 Thoughtful individuals would place confusing items in the basket, and Audrey would email the FAS Green Program to get clarification and then post the item on the correct bin. REGULARLY POST PROGRESS: Each floor had a centrally located display board where their grades were tabulated and all the grades for the competition could be seen. RECYLCEABLE-OF-THE-WEEK: Each board also featured a recyclable of the week, which changed every Monday. Often times, the recyclable would be something that was frequently found in the trash of the whole building. Yogurt cups were a frequent offender at the beginning of the competition, but their presence in trash cans dropped significantly during the competition. CELEBRATE SUCCESS AND HAVE FUN! Creating a fun trophy and holding a small celebration for the winning office not only helps recognize some of the folks who worked very hard, but gives offices an incentive to strive to be winners, especially if the contest is held annually. Student Intern Emma Framson made a trophy out of recycled aluminum cans, and we gave the trophy to the winning floor, Human Resources!